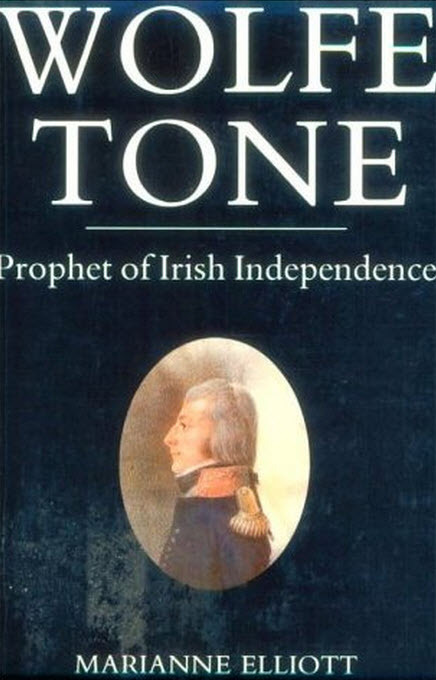 Aside from his own words to be found in his autobiography and many pamphlets and letters, 18th century Irish Republican revolutionary Theobold Wolfe Tone has been crying out for a modern biography for decades. Regarded by many as one of the founding fathers of the Republican tradition in Ireland Tone’s complex and multi-layered life, that led him from being the personification of late 1700s middle class respectability to a revolutionary icon for all later generations of Irish Republicans, and the Irish people as a whole, is worthy of any historian worth their merit. Unfortunately in the hands of historian Marianne Elliott all that potential comes to little. Though Elliott does a workmanlike job in presenting Tone’s life, with many fascinating insights and facts, her account of him is pervaded with a rather obvious lack of empathy with the person and the politics of which she writes. This is hardly surprising as Marianne Elliott has become one of the chief proponents of the so-called revisionist school of historians in Ireland and Britain, that is those academics who act as apologists for British rule in Ireland and through their works display an often biased or one-sided account of Irish history under the pretence of `neutrality’. Frequently named elsewhere as `apologist historians’ and compared to the fringe historians in the United States who defend the 19th century Southern Confederacy or Russian historians who defend the old 20th century Soviet Union, this group of historians (mostly British based or trained) have in recent years come under increasing attack and censure. Though a worthy effort in many areas, Elliott’s unfortunate dislike of Irish nationalism (in whatever form), colours everything, leaving an unfair and ultimately flawed book. Perhaps the review of Irish historian Dr. Anthony Coughlan sums up the book best, when he describes it as a, `fundamentally hostile interpretation of Tone… the author evidently has little sympathy for the ideal of an All Ireland Republic which Tone and his fellow Protestants came to adopt in the 1790s’.